The US Justice Department has acknowledged an intrusion in its computer network as the notorious hacker collective Anonymous claimed to have obtained large amounts of data from it. 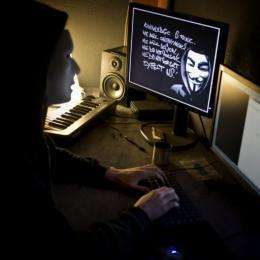 The US Justice Department acknowledged an intrusion in its computer network as the notorious hacker collective Anonymous claimed to have obtained large amounts of data from it. "The department is looking into the unauthorized access of a website server operated by the Bureau of Justice Statistics that contained data from their public website," a statement sent to AFP said. "The Bureau of Justice Statistics website has remained operational throughout this time. The department's main website, justice.gov, was not affected." The statement said the agency "is continuing protection and defensive measures to safeguard information" and will open a criminal probe into any activity that appears illegal. Earlier in the day a Twitter message and blog post believed to be from the hacker collective claimed to have obtained large amounts of data from the Justice Department site that it was releasing. 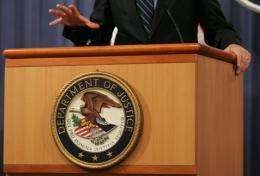 The message said the hackers were releasing "1.7GB of data that used to belong to the United States Bureau of Justice, until now." File photo of a masked member of the Anonymous hacker group. A Twitter message and blog post believed to be from the hacker collective has claimed to have obtained large amounts of data from the Justice Department site that it was releasing. "Within the booty you may find lots of shiny things such as internal emails, and the entire database dump," said the post by a blogger using the name Jimmy89. "We do not stand for any government or parties, we stand for freedom of people, freedom of speech and freedom of information. We are releasing data to spread information, to allow the people to be heard and to know the corruption in their government. We are releasing it to end the corruption that exists, and truly make those who are being oppressed free." The group, which is believed to be a loosely affiliated network of "hacktivists," briefly shut the Justice Department website earlier this year after the file-sharing website Megaupload was seized. It has attacked sites of groups as varied as MasterCard and Visa, and the Tunisian and Yemen governments. Anonymous? They seem to be going to some effort to publicize themselves. Blaming Anonymous is more politically convenient than foes from elsewhere.